EVOLUTION FOAM ™ conforms to each athletes body shape and allows for air return circulation, cooling the body in high temperatures along with specialized antibacterial agents that prevent the vest from odor build up. TECTONIC FOAM PLATING™ in a unique double layer pattern, moves and flexes with the rider without any separation or gaping. FLEX LACE CLOSURES™ along with additional darting on the front and back of the vest provide a more customized fit allowing the vest to expand and contract with the athletes movements while offering easy quick fit adjustment with draw string clip and added side flap protection. REFLECTIVE TRIM around the edges of the vest provides higher visibility and increased safety. All equestrian sports are dangerous and involve the risk of serious injury or death. 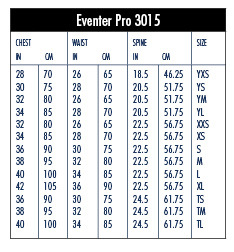 A properly fitted protective vest or body protector may offer protection against some injuries. However, protective vests and body protectors do not all conform to a uniform set of safety standards. Protective vests and body protectors offering more protection may be capable of being designed and/or may not be presently available. It is the sole responsibility of the purchaser (or in the case of minors, the parent, or other responsible adult) to select an appropriate protective vest or body protector that is well suited to the rider’s level of expertise and riding discipline and to ensure it is properly fitted. Dover Saddlery neither specifies nor recommends any particular protective vest or body protector and undertakes no responsibility or liability therewith. CAUTION:The protective qualities of all protective vests and body protectors may be compromised by age, use and exposure to temperature extremes. Store protective vests and body protectors in well ventilated areas and follow the manufacturer’s recommendations for cleaning and maintenance. 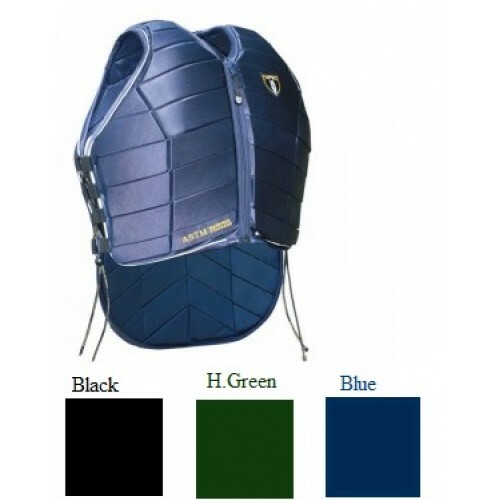 Dover Saddlery neither specifies nor makes warranties as to the fitness for use of any particular protective vest or body protector nor assumes any responsibilities or duties to any purchaser. Please consult manufacturer’s own warranty and safety disclaimers.